Register by May 12 for the Crossroads Trail Run/Walk to receive the early bird special. 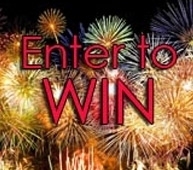 Save $5 on each entry and to secure your performance T-shirt. June 22 is the 10th annual trail run and walk event, held at Crossroads at Big Creek Learning Preserves, 2041 Michigan Street, Sturgeon Bay. Be one of the runners or walkers of all ages who come together for this unique 2k, 5k, or 10k event on the trails in the midst of a 200 acre preserve. Crossroads Trail Run is a family event. Participants 7 and younger and 70 and up may register free. Go to www.CrossroadsRun.com to register and for more information. Along with a great run, all participants will receive a performance T-shirt, a native tree at the finish line, and locally produced refreshments. Who wouldn’t want a Lautenbach cherry sundae topped off with a freshly made energy bar to welcome in the summer solstice! This course follows the perimeter trail of the Crossroads property, through the coniferous woods, over wooden bridges, and through the Wild Ones Meadow. The well-marked trails are supported by many encouraging volunteers. This event is for competitive and recreational health enthusiasts alike. The Milwaukee Brewers lost to the Los Angeles Dodgers 3-1 Thursday night. Zach Davies started on the mound for Milwaukee. He had a stellar performance going five innings and not giving up a single run. Eventually, his start would be squandered after Matt Albers gave up three runs in an inning. Hits were few and hard to find for the Brewers. They were getting no-hit well into the fifth inning before Orlando Arcia broke it up with a single. Christian Yelich would eventually hit his 10th homer in the ninth inning but it wasn’t enough as the Brewers fell. The two teams will now run it back for a Friday night game. Jhoulys Chacin will start on the bump for the Brewers. Ross Stripling will grab the rock for the Dodgers. First pitch will be thrown out at 7:10. A shot off the post in the game's 20th minute set up the game's lone goal in a 1-0 Sturgeon Bay loss to NEW Lutheran at City Stadium in Green Bay. The Clippers offense made life difficult for Blazers goalkeeper Sadie Johnsen, who had to make six saves in the game and needed several other defensive stops in her own box to keep the tally that low. The games lone goal came from the Blazers' Abbey Czaja after she was the only one to locate the deflected ball after it went off the post. It took that kind of luck to add a blemish to the afternoon for Clippers goalkeeper McKenna Gibson, who made three saves in the game. In other soccer action at City Stadium, Luxemburg-Casco lost to Green Bay East 2-1. Big innings gave Southern Door and Algoma wins in Packerland Conference play Thursday. Grace LeGrave and Lexi Wery did it all for the Southern Door Eagles against Kewaunee striking out a combined eight batters and each getting two hits and an RBI in its 8-3 victory. A three-run sixth inning and a commanding performance by Maddie Prokash in the circle gave Algoma the 6-1 victory over Oconto. You can find full recaps online at DoorKewauneeHighSchoolSports.com. There were plenty of nailbiters at Packerland Conference baseball games Thursday. In Fish Creek, Sturgeon Bay needed a trio of two-out base hits and great pitching performance to shutout Gibraltar 3-0. Southern Door scored a pair of runs on wild pitches, including Devin Schinkten on the eventual game-winner in the sixth inning to give the Eagles the 3-2 victory over Kewaunee. Algoma was shut out against Oconto 11-0 as Max Panger accounted for two of the Wolves' three hits. You can find complete recaps of the games online at DoorKewauneeHighSchoolSports.com. The Kewaunee boys track team won the Packerland Relays meet Thursday in Oconto behind six first-place performances. According to Kewaunee Head Track Coach Joe Kassner, those performances include 4x1 Relay Owen Kudick,Alex Hlinak,Collin Hlinak,Will Murphy - Sprint Medley Max Hanrahan,Charles Schultz,Alex Hlinak,Allan Hager - Discus Elliot VanGoethem, Tanor Bortolini, Jon Odill - Long Jump Alex Hewett,Owen Kudick,Ben Heim - Shot Put Brock Kleiman,Elliot VanGoethem, Tanor Bortolini - Triple Jump Alex Hewett,Collin Hlinak,Ben Heim. Scoring 124.5 points, the Storm was followed on the leaderboard by Sturgeon Bay (93.5) and Peshtigo (93). On the girls' side it was Sturgeon Bay getting the upper hand on Kewaunee, outscoring the Storm 118.5 to 114.5. Algoma took third with 69 points. Individual results will be posted on DoorKewauneeHighSchoolSports when they are available. The Milwaukee Brewers lost to the St. Louis Cardinals 6-3 Wednesday afternoon. Corbin Burnes started on the bump and got roughed up again in his start. He barely made it past three innings and gave up five runs in the process. He’s a good young pitcher that will look to find his stride here in the season. Milwaukee’s pitchers stayed hot at the plate as relief pitcher, Aaron Wilkerson launched a two-run bomb in the fifth inning. Christian Yelich also singled in a run in the game to give him eleven RBI’s in the series. The Brewers haven’t lost a set to the Cardinals yet. Milwaukee will now stay at home and welcome in the Los Angeles Dodgers for a weekend series. Zach Davies will have his name called in the rotation. He will square off against Julio Urias of the Dodgers. First pitch will be thrown out at 7:10 from Miller Park on Thursday. The Milwaukee Bucks are not taking their foot off the accelerator. 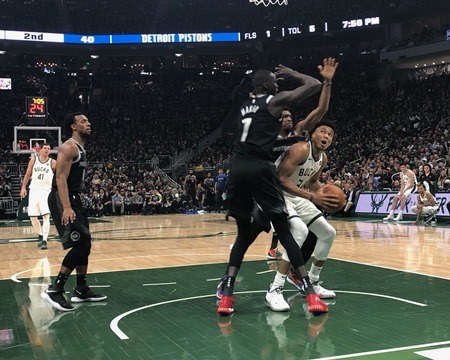 Following a 35 point win Sunday in game one, Giannis Antetokounmpo and friends eased past Detroit by 21 on Wednesday night. The 120-99 win featured game-high scorer Eric Bledsoe's 27 point performance. The "Greek Freak" added 26 points and 12 rebounds in only 29 minutes. The difference maker Wednesday was Pat Connaughton. His 18 points, nine rebounds and four blocked shots off the bench energized the team and the crowd. Fiserv Forum was raucous Wednesday from the opening tip through the final buzzer. Celebrity appearances by Aaron Rodgers, Danica Patrick, Ryan Braun, Christian Yelich, David Bahktiari, Greg Jennings and many more also seemed to give the game a little more juice Wednesday night. Game three of the best of seven series moves to Detroit Saturday night for a 7:00 PM tip-off. Game four will follow Monday at 7:00 PM and if necessary game five would be back in Milwaukee Wednesday, April 24. The Green Bay Packers’ 2019 NFL regular-season schedule – highlighted by five prime-time contests (subject to flexible scheduling) on the original schedule for the sixth straight year (2014-19) – was released Wednesday evening by the National Football League. The Packers will open the season at the Chicago Bears in the NFL’s Thursday night regular-season opener. It marks the fourth time in team history that Green Bay has opened at Chicago (1979, 1981, 2015). The Packers will open their home slate in Week 2 against the Minnesota Vikings, marking just the fourth time (2003, 2008, 2018) since the NFC North was formed in 2002 that Green Bay has played division opponents in both of the first two games. Green Bay stays at home both of the next two weeks, the first time the Packers have played three straight at home in September since 1990 (Weeks 1-3). They host the Denver Broncos in Week 3 and the Philadelphia Eagles in a Thursday night matchup in Week 4. The Packers travel to take on the Dallas Cowboys in Week 5. For the second time in three seasons, the Packers will host the Detroit Lions on Monday Night Football, this time in Week 6. It is the fifth Monday night matchup between the two clubs (1964, 1971, 1972, 2017). A home game against the Oakland Raiders in Week 7 will be the Packers’ fifth at Lambeau in 2019, marking the most home contests for Green Bay in the first seven games of a season since 1978 when it also played five at home (not including the 1987 strike year). Over the next six weeks, the Packers play four road games and one home contest. In Week 8, Green Bay is at Kansas City in a Sunday night matchup. The following week, Green Bay travels to Los Angeles to take on the Chargers. In Week 10, the Packers host the Carolina Panthers in the fourth contest between the two teams in the last six years (2014, 2015, 2017). Green Bay will have its bye the following week, marking the first Week 11 bye for the Packers and the latest for the team since the bye was reintroduced in 1990. Over the next two weeks, Green Bay will crisscross the country, playing at the San Francisco 49ers in Week 12 and at the New York Giants in Week 13. The Packers have won five of their last six at the 49ers, including their last trip in 2015 (17-3). The Packers’ final two regular-season home games will take place in Weeks 14-15. First, they take on the Washington Redskins in the third matchup between the two in the last five years (including the postseason) but the first in Green Bay since 2013. Week 15 has the Bears coming to Green Bay and starts a run of three straight divisional games to finish the regular season for the third time since the NFC North was formed in 2002 (2006, 2016). The Packers close out the regular season with two road games for the first time since 2004 when they played at Minnesota and Chicago. In Week 16, Green Bay is at the Vikings and on MNF for the second time. Green Bay will close out the regular season against the Lions for the fourth straight year and the fifth time in the last six seasons. For ticket information, please visit www.packers.com/tickets. For a secure method to buy and sell tickets, the Packers encourage fans to use NFL Ticket Exchange, www.ticketmaster.com/packers. “Flexible scheduling” will again be used in Weeks 11-17. In Weeks 11-16, the schedule lists the games tentatively set for Sunday Night Football on NBC. Only Sunday afternoon games are eligible to be moved to Sunday night, in which case the tentatively scheduled Sunday night game would be moved to an afternoon start time. A flexible scheduling move would be announced at least 12 days before the game. For Week 17, the Sunday night game will be announced no later than six days prior to December 29. The schedule does not list a Sunday night game in Week 17, but an afternoon game with playoff implications will be moved to that time slot. Flexible scheduling ensures quality matchups in all Sunday time slots in those weeks and gives “surprise” teams a chance to play their way into primetime. Flexible scheduling will not be applied to games airing on Thursday or Monday nights. Sunday night games in Weeks 5-16 are subject to change. at Chicago, Sept. 5, 7:20 p.m. CT (NBC) – It is the third time in five years that the Packers have opened the season against the Bears (at Chicago in 2015, vs. Chicago in 2018)… Marks the 14th consecutive regular season that the Packers and Bears have squared off in primetime…It is the third time in the last nine seasons (2011 and 2014) that Green Bay will play in the NFL’s Thursday night regular-season opener…Including a 2010 playoff victory at Chicago, Green Bay has won 20 of the last 25 meetings between the rivals at Soldier Field…Six of the last seven games between the two at Soldier Field have been decided by single digits. vs. Minnesota, Sept. 15, 12 p.m. CT (FOX) – Including playoffs, Green Bay has a 7-3-2 mark (.667) against the Vikings at Lambeau Field since 2008…The Packers have scored 23-plus points in 11 of the last 13 home games vs. Minnesota…Green Bay is 4-1-1 the last six home September contests against the Vikings…It is the second consecutive year that the Packers have hosted the Vikings in Week 2.
vs. Denver, Sept. 22, 12 p.m. CT (FOX) – The Packers are 5-0-1 all-time against the Broncos at home…Green Bay has won three of the last four regular-season games against Denver…It is the Broncos’ first visit to Lambeau Field since 2011, a 49-23 Packer victory…The Packers have scored 30-plus points in all five home wins. vs. Philadelphia, Sept. 26, 7:20 p.m. CT (FOX/NFLN/Amazon) – Packers have won five of the last six against the Eagles in the regular and postseason, including two of three in Green Bay…It is the first time the Packers have played Philadelphia in a Thursday night game…Also the first time Green Bay has played two Thursday games in the month of September. at Dallas, Oct. 6, 3:25 p.m. CT (FOX) – It is the seventh matchup between the two teams in the regular and postseason since 2013, with Green Bay holding a 5-1 record in those contests…Playing at Dallas in Week 5 for the second time in three seasons…Including the playoffs, Green Bay is 3-0 against Dallas at AT&T Stadium. vs. Detroit, Oct. 14, 7:15 p.m. CT (ESPN) – Marks the 27th consecutive season (1993-2019) that Green Bay is appearing on Monday Night Football…Green Bay has won six of its last eight home games on MNF…Sixth time in the last seven seasons the Packers have played at Lambeau Field on MNF…Including a 1994 playoff victory, the Packers are 25-3 against the Lions in the state of Wisconsin since 1992.
vs. Oakland, Oct. 20, 12 p.m. CT (CBS) – It starts a stretch of three straight games against AFC West teams, the first time the Packers have had three straight games against AFC teams since playing the AFC West in 2003 in Weeks 15-17…Dating back to 1990, the Packers are 7-0 against the Raiders…Green Bay has scored 30-plus points in each of the last four contests…It is only the second time (at Oakland, 1976) the two teams have played in the month of October. at Kansas City, Oct. 27, 7:20 p.m. CT (NBC) – It will be the 12th regular-season game between the Packers and Chiefs, but the first Sunday night matchup between the two…Green Bay has won two of the last three games against Kansas City…It is the third time the two have faced off in primetime, having previously played two games on MNF (1993, 2015). at Los Angeles Chargers, Nov. 3, 3:25 p.m. CT (CBS) – While it’s the first time the Packers will play the Chargers since they moved to Los Angeles, it is the seventh away game against the Chargers, and Green Bay has won the previous six…One of six games the Packers have against 2018 playoff teams (Chicago twice, Philadelphia, Dallas, Kansas City), with four of those contests taking place on the road…The Packers are 10-1 all-time vs. Chargers, a .909 winning percentage that is tops by Green Bay versus any team. vs. Carolina, Nov. 10, 12 p.m. CT (FOX) – Four of the last five matchups between the two teams have been decided by eight points or less…The Packers are 9-6 overall against Carolina, with wins in six of the last 10 (including playoffs)…Green Bay is 4-2 at home against Carolina in the regular and postseason, including a win in the last matchup at Lambeau in 2014…The Packers have scored 30-plus points in five of the six home games against the Panthers. at San Francisco, Nov. 24, 3:25 p.m (FOX) – It is the first of two straight road games for the Packers, marking the second straight year they played on the road in the first two games after the bye week…Second game for Green Bay at Levi’s Stadium (2015)…Dating back to 1996, Green Bay is 11-2 against San Francisco during the regular season. at New York Giants, Dec. 1, 12 p.m. (FOX) – It is the second straight year Green Bay will play at MetLife Stadium, having defeated the New York Jets in overtime last season in December in Week 16 (44-38)…It is the first time since 2013 that the Packers will face the Giants at MetLife Stadium. vs. Washington, Dec. 8, 12 p.m. (FOX) – The Packers have won four straight home games against the Redskins, outscoring Washington 122-43 in those contests…It is the first time the Redskins have played at Lambeau in December…Packers Head Coach Matt LaFleur coached quarterbacks for Washington from 2010-13.
vs. Chicago, Dec. 15, 12 p.m. CT (FOX) – Green Bay has won nine of the last 11 meetings against the Bears at Lambeau Field…The Packers have outscored Chicago, 299-157, in the last 11 home games, scoring 20-plus points in nine of those contests…It is the first time since 2010 that the Packers-Bears game at Lambeau Field will not be in primetime…Green Bay is 10-2 all-time at home against the Bears in December/January games. at Minnesota, Dec. 23, 7:15 p.m. (ESPN) – The Packers last played two Monday games in the same regular season in 2009…It is Green Bay’s first MNF game at Minnesota in December since 1999…Of the past 33 regular-season meetings between the teams, 22 of those games have been decided by seven points or less…The Packers have a 28-29 record in away games against the Vikings. at Detroit, Dec. 29, 12 p.m. CT (FOX) – The Packers lead the regular-season series, 98-72-7 (.576), and have won both postseason contests the two have played…Green Bay’s 98 wins over the Lions are the most the Packers have against any team…Dating back to 2007, Green Bay has won five of seven games played between the two in Week 17, with the winning team scoring 30-plus points in each of those games. Being a leader on the Gibraltar track team is nothing new for senior Bria Caldecott. The lone senior has led by example since she first joined the team, qualifying for the state meet last year in the high jump and as a member of the Gibraltar girls 4 x 100-meter relay. Caldecott credits her coaches and her teammates for the success she has been able to enjoy. One of the recipients of this year’s Volunteer Center of Door County youth scholarship awards, Caldecott plans on attending UW-Madison next year. Gibraltar will join its conference rivals in Oconto Thursday afternoon for the Packerland Relays meet beginning at 4:30 p.m. You can find the full video interview with Caldecott online at DoorKewauneeHighSchoolSports.com. Nine different games on local softball and baseball diamonds could be in jeopardy after rain hit the area last night with more on the way later today. Over an inch of rain was expected to fall last night and early this morning in Door and Kewaunee Counties. There is even a slight chance of showers to occur at around 3 p.m. Luxemburg-Casco played their games scheduled for Thursday on Tuesday to avoid having to reschedule the contests for a later date. If teams take the diamond today, baseball action beginning at 5 p.m. includes Algoma hosting Oconto, Sturgeon Bay traveling to Gibraltar, Southern Door battling in Brussels against Kewaunee, and Sevastopol playing at home against NEW Lutheran. Softball games for this afternoon include the Spartans getting an early 4:30 start against Little Chute. Packerland Conference games beginning at 5 p.m. include Southern Door hosting Kewaunee, Sevastopol playing at home against NEW Lutheran, Sturgeon Bay traveling to Gibraltar, and Algoma battling Oconto at home. Two teams with local ties will head to the former home of the Green Bay Packers for a pair of soccer matches Thursday. Field conditions at NEW Lutheran will move Sturgeon Bay's match against the Blazers to City Stadium at Green Bay East High School for a 4:00 p.m. opening kick. Luxemburg-Casco will follow with its match against Green Bay East at 6:30 p.m.
Due to yesterday’s rain, the Kewaunee and Baileys Harbor soccer fields have standing water. Tonight’s scheduled varsity game is going to be played, April 23rd at Kewaunee and the previously scheduled JV game is postponed at this time while we work to find a new date. Luxemburg-Casco Baseball resumed conference play Tuesday with a home/road doubleheader in Luxemburg against Fox Valley Lutheran. Senior Captain Ian Doell threw a complete game shutout gem to get the Spartans to a 5-1 record. Behind his dominant performance, LC racked up six hits. Jake Cravillion and Jack Kinnard each had multiple hits for Luxemburg-Casco Spartans. Kinnard and Cravillion each collected two hits to lead Luxemburg-Casco Spartans. Luxemburg-Casco Spartans didn't commit a single error in the field. Bryce Davister had nine chances in the field, the most on the team. Senior Captain Noah Lindsley took the loss for Luxemburg-Casco Spartans. He allowed nine hits and three runs over five and two-thirds innings, striking out five and walking one. Luxemburg-Casco Spartans scattered seven hits in the game. Jack Kinnard and Owen Deprez all collected multiple hits for Luxemburg-Casco Spartans. Deprez and Kinnard each managed two hits to lead Luxemburg-Casco Spartans. The loss brings LC to a 5-2 record overall and a 4-2 record in conference. Next up is a Tuesday game in Luxemburg where the Spartans will host conference opponent Freedom with the opening pitch at 4:30 pm. All seven Door and Kewaunee County track and field teams were in action on Tuesday for both boys and girls. Algoma, Southern Door and Gibraltar were all in Algoma. Sevastopol, Sturgeon Bay and Kewaunee participated at Kewaunee. Luxemburg-Casco was on their home track. For the girls in Algoma, the Wolves won their meet picking up 94 points. Southern Door came in second with 68 points, while Gibraltar got 44. Oconto came in last with 29. On the boys side, Southern Door won with 113 points. 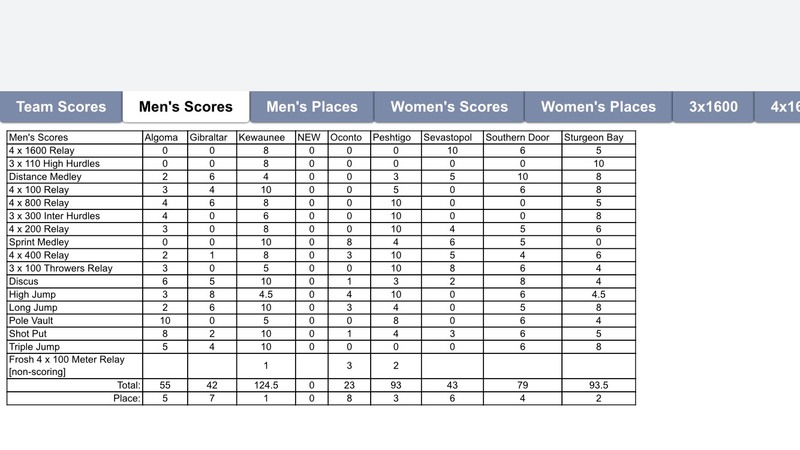 Algoma and Gibraltar came in second and third respectively with 87 and 54 points. In Kewaunee, the Storm won for both the boys and the girls. The boys picked up 136 points and the girls got 119. Sturgeon Bay tied for second with Peshtigo on the boys side with 99, while the girls got second with 106. Sevastopol's boys finished in fourth with 20 points and the girls got third with 71. Luxemburg-Casco's boys and girls came in second as the hosts both behind Fox Valley Lutheran. The boys scored 58 points and the girls got 67.5. Tuesday's games on the diamond were headlined by the "War on the Shore" rivalry between the Storm and the Wolves at Kewaunee. On the baseball side, Kewaunee crushed Algoma 10-0 in six innings. Two Door County rivals faced off when Sturgeon Bay beat Southern Door 6-2. The game was played at Sturgeon Bay. Gibraltar fell to Peshtigo on the road 7-1. In softball, The Algoma softball team made sure the Wolves didn't go winless against their rivals, beating Kewaunee 4-0. Luxemburg-Casco defeated Fox Valley Lutheran 8-5 at home. Sevastopol went to Oconto and lost 9-0. Sturgeon Bay and Luxemburg-Casco were winners on the pitch on Tuesday. Both won by at least two goals. The Clippers went on the road to Marinette to get a 5-2 victory. It was the first win of the season for Sturgeon Bay. L-C played a home game against Waupaca and got a 3-1 win. Brynn Holzwarth scored twice for the Spartans. The Milwaukee Brewers beat the St. Louis Cardinals 8-4 Tuesday night. Brandon Woodruff started on the bump and pitched an absolute gem. He went nearly six innings only giving up two earned runs. He fanned six Cardinal batters on the night. Jack Flaherty took the loss for St. Louis. The Brewers got on the board early and often. Lorenzo Cain started it off with a solo shot in on the third inning. Then, Yasmani Grandal hit a two-run shot of his own in the same inning. Christian Yelich joined the fun later with a three-run bomb of his own. He has now hit eight homers against the Cardinals alone this year. To go along with ten RBI’s in this series so far. Milwaukee will now look to sweep the Cardinals and wrap up the series on Wednesday. Corbin Burnes will be taking the mound for the Brewers. First pitch will be thrown out at 12:40. Packers alumnus John Kuhn has joined the team as sports analyst for the organization’s digital, broadcast and game presentation department, Gabrielle Dow, Packers vice president of marketing and fan engagement announced today. Kuhn, a former fullback who played nine seasons in Green Bay, was a key member of teams that won Super Bowl XLV and five division titles. During his time as a player, Kuhn developed an interest in media and broadcasting and participated in the NFL Broadcasting Boot Camp in 2015. He spent time during and after his playing career guest-hosting and co-hosting a variety of radio and live sports programs. In his new role as sports analyst, he will create and contribute content to the Packers’ digital properties, including packers.com and the team’s social media platforms. Kuhn, a York, Pennsylvania, native, began his career with the Pittsburgh Steelers in 2005 and was claimed off waivers by Green Bay in 2007, where he went on to earn three Pro Bowl selections (2011, 2014-15). He finished his career playing two seasons (2016-17) with the New Orleans Saints, and officially retired as a Packer in March of this year. The Green Bay Packers claimed K Sam Ficken off waivers from the Seattle Seahawks. General Manager Brian Gutekunst announced the transaction Monday. Ficken, a 6-foot-1, 192-pound, first-year player out of Penn State, was originally signed by the Jacksonville Jaguars as an undrafted free agent in 2016 but was released late in August that year. He spent part of the 2017 training camp with the Kansas City Chiefs. Late in the 2017 season, Ficken played in two games for the Los Angeles Rams, connecting on two of three field goals, four of five extra points and recording five touchbacks on eight kickoffs. Last season, he appeared in two games for the Rams and made all 10 extra points, one of three field goals and recorded 11 touchbacks on 13 kickoffs. Ficken will wear No. 7 for the Packers. The Milwaukee Brewers beat the St. Louis Cardinals 10-7 on Monday night. Freddy Peralta started on the bump for Milwaukee and went a little over three innings giving up three earned runs. Lorenzo Cain made another crazy leap at the wall to rob a homer early on in the game. It’s the second time he’s done that early on in the season. Christian Yelich had another monster night. He hit three bombs in the game and drove in seven runs for the Brewers. He gave a tip of the hat to the crowd as they begged for a curtain-call after his third one. He is right on pace to make another run at MVP this year. Milwaukee will now run it back for game two on Tuesday. Brandon Woodruff will look to make his second start against the Cardinals. He will be going against Jack Flaherty of St. Louis. First pitch will be thrown out at 6:40 from Miller Park. Southern Door baseball manager Dave Neinas tries to be a coach on a diamond and a dad at home, but that does not mean those lines did not blur a little bit earlier this month. It was Neinas’ son Charlie that went the distance to record a no-hitter against the Algoma Wolves 1-0 on April 5th. The freshman hurler struck out 10 Wolves batters while allowing only three to reach. Neinas says they were able to crack a small smile after a wild pitch gave the Eagles a slim lead. Winning two close games give the Eagles a perfect 3-0 record heading into Tuesday matchup against rival Sturgeon Bay. Other Packerland Conference baseball games scheduled to begin at 5 p.m. Tuesday include Algoma traveling to Kewaunee, Sevastopol battling at Oconto, and Gibraltar playing at Peshtigo. Luxemburg-Casco will host a doubleheader against Fox Valley Lutheran at 4 p.m.
Southern Door fans, you can find the complete interview with Coach Dave Neinas online at DoorKewauneeHighSchoolSports.com. Four matches highlight Tuesday's soccer slate in Door and Kewaunee Counties. It's been feast or famine for the Luxemburg-Casco Spartans, shutting out their opponents three times while being held scoreless four times. The Spartans hope to get back in the win column at 4:30 p.m. when it hosts Waupaca. After playing Roncalli on Monday, the Kewaunee Storm are back in action on Tuesday at Valders with the first kick at 4:30 p.m.. Prior to Monday the Storm has a loss and a win on the ledger, both by 8-0 scores. Gibraltar/Sevastopol hopes to get their first decision of the year when it plays at Kiel this afternoon at 4:30 in Institute. Sturgeon Bay hopes to stop a three-game slide when it battles at Marinette. Local track teams will play musical chairs this afternoon as the opponents stay relatively the same while traveling to different locations. Luxemburg-Casco will play host to Denmark and Fox Valley Lutheran in a Northeastern Conference Triangular meet. The meet begins at 4 p.m. with field events. Packerland Conference quad meets have Algoma hosting Oconto, Gibraltar, and Southern Door while Sevastopol, Sturgeon Bay, and Peshtigo will head to Kewaunee. Both Packerland Conference meets start at 4:30 p.m. The Kewaunee Storm scored a big home win in Packerland Conference action Monday evening, while the Spartans could not get the bats going in a loss to Seymour. In Luxemburg, Heather Dart's triple set up the Spartans' only run in the 6-1 loss. Ally Dart took the hard loss, giving up three runs while scattering six hits. In Kewaunee, the Storm's Claire Kohnle did it all as she pitched a complete game and went 3-4 in an 8-5 win over Gibraltar. Karlee Kita provided some of the offensive punch for the Vikings, going 3-3 at the plate. Softball action Tuesday includes Algoma traveling to Kewaunee, Sturgeon Bay hosting Southern Door, Gibraltar heading to Peshtigo, and Sevastopol heading to Oconto. For the first time this season, the Sturgeon Bay Clippers baseball team tasted defeat in a 14-4 loss to the Wrightstown Tigers Monday night. The Clippers scored three runs in the opening frame, but struggled to keep up with the Tigers' offense, which scored in all five innings played including four in the first and five in the fourth. Max Bordeau struck out five in two innings of work. Weather permitting, the Clippers look to get back on track with a 5 p.m. tilt at home against Southern Door. The Milwaukee Brewers faced the Los Angeles Dodgers and lost 7-1 on Sunday afternoon. Jhoulys Chacin started on the bump for Milwaukee and had a tough go at it. He went a little over two innings giving up six earned runs on the night. The Brewers were never able to rally back from the deficit in the game. Ross Stripling made it tough on the Brewers lineup. He went eight efficient innings only giving up one earned run in the game. The team only mustered up four hits on the afternoon. Chase Anderson and Jacob Barnes came in relief and pitched really well to end the game on a positive note. The Brewers now move to 10-6 on the season and still sit in first place. They will now travel back home to take on the St. Louis Cardinals in a three-game series. Freddy Peralta will have his name called in the rotation for Milwaukee. He will be facing Dakota Hudson of the Cardinals. First pitch will be thrown out from Miller Park at 6:40. With rain in the forecast later this week, Monday becomes the best chance for at least one area baseball team to get some action in before the Easter break. Both the Varsity and JV baseball games between Sturgeon Bay and Wrightstown are scheduled to be played on Monday at 4:30pm at two different fields in Wrightstown. The Clippers are on a hot start to begin the season, outscoring its competition by a 80-16 margin, which includes a postponed game against NEW Lutheran still to be decided. Even with last week's snow sticking around, Monday may be the driest day for softball teams to get in games. Monday's games include Kewaunee hosting Gibraltar, Luxemburg-Casco playing at home against Seymour, and Sturgeon Bay battling against Peshtigo. The Spartans will play at 4:30 p.m. while the two games involving Packerland Conference teams have been moved up to 4 p.m. You can find more on these games at DoorKewauneeHighSchoolSports.com. After losing out on a day or two last week, area soccer teams like Kewaunee are hopeful they will get in more matches this week. The Storm will head south for a 4:30 p,m. matchup against Roncalli. After opening up the season with an 8-0 win over Green Bay West, the Storm hopes they can rebound from an 8-0 loss against Denmark. It is the first of three games this week for the Storm, which heads to Valders on Tuesday before its first Packerland Conference match against Sevastopol/Gibraltar on Thursday. Zach Davies strong start on Saturday night led the Brewers to a 4-1 victory over the Dodgers in Los Angeles. He went 7 innings only allowing 1 run and striking out 6. The only run Davies allowed was a solo home run to Cody Bellinger. Junior Guerra pitched 2 perfect innings to close the game out and get the save. Mike Moustakas and Orlando Arcia hit solo home runs and Travis Shaw added a 2-run single to provide the scoring for Milwaukee. The Brewers go for the sweep on Sunday. Jhoulys Chacin starts for Milwaukee against Ross Stripling for the Dodgers. First pitch is at 3:10 PM. All of Door and Kewaunee County high school sports scheduled for Saturday was postponed or canceled except for Luxemburg-Casco soccer. The Spartans went to Ripon and picked up a 1-0 victory. Heather Iverson scored on a penalty kick to supply the only goal of the game. Natalie Haen notched another shutout. The game was originally supposed to be played on Friday but was postponed by a day because of the poor field conditions at Ripon. The Spartans next game will be their first one in the conference when they take on Waupaca at home on Tuesday at 4:30 PM. The Brewers played their fourth straight game in Southern California and finally got a victory on Friday. After getting swept in a three-game series against the Los Angeles Angels, Milwaukee defeated the team that knocked them out of the playoffs last year. The Brewers defeated the Dodgers 8-5 behind terrific performances from the offense and the bullpen. Hernan Perez and Yasmani Grandal each hit two-run home runs. Grandal played the last four seasons for the Dodgers before signing with the Brewers this past offseason. Corbin Burnes started on the mound for the Brewers and he struggled, allowing 5 runs in just 4 1/3 innings. The bullpen cleaned things up and pitched 4 2/3 scoreless innings. Matt Albers was the first replacement for Burnes and he picked up the win. The Brewers continue their series in Los Angeles Saturday night at 8:10 PM. A winter storm will force athletic directors to rearrange schedules over the next several weeks. All of yesterday's games and practices were wiped out when area schools closed early due to winter weather and deteriorating road conditions. There are still several games on the schedule for Friday and Saturday, but that is certainly subject to change. We will update as we know more. Luxemburg-Casco Soccer vs Ripon now 4/13 at 1 p.m.
With our game against NEW Lutheran suspended after 3 innings on 4-8-19, both teams girls softball and boys baseball will make up their games in a doubleheader on May 2nd at PBI and Memorial Field respectively, game start time will be 4 PM. With today's inclement weather we also have rescheduled our games against Sevastopol for Thursday to be played in the same doubleheader format at Sevastopol on May 6th. Time: TBD. Games scheduled for Friday 4-12-19 softball at Algoma and Saturday morning 4-13-19 baseball are looking to be rescheduled as well. More details to follow. The Milwaukee Bucks played host to the Oklahoma City Thunder on Wednesday night and lost 127-116. Finishing first in the NBA with a record of 60-22. Heading into the matchup they were planning to be without Giannis and a couple of other key pieces due to rest before the playoffs. Aaron Rodgers was sitting court-side to cheer on his team for the game. He is a minority owner of the Bucks. Milwaukee got off to a hot start even though they had a good majority of their team out. After the first quarter, they were out ahead of the Thunder 31-29. DJ Wilson got to it right away scoring nine points to lead the way for the Bucks. Tim Frazier also pitched in nine points and five assists of his own. It was a different story in the second quarter as the Thunder came out and took the lead back. Dennis Schroder would finish up with 15 points at halftime for the Thunder. The Bucks focused heavily on getting some of the deeper bench players some minutes since they already wrapped up home-court advantage throughout the playoffs. It was all Thunder in the second half. Dennis Schroder was the high scorer in the game with 32 points for Oklahoma City. Tim Frazier had a career-high 29 points and 13 assists in the loss for the Bucks. Khris Middleton added 21 on the night. The Bucks will now rest up a couple of days before beginning round one of the playoffs Sunday. They will be matched up against the Detroit Pistons. Milwaukee is poised to make a deep run in the playoffs this year. They will kick off game one and two at the Fiserv Forum. The Milwaukee Brewers lost to the Los Angeles Angles 4-2 Wednesday night. Brandon Woodruff started on the bump for Milwaukee and went six innings giving up four earned runs with seven strikeouts. The bullpen would hold the Angels scoreless the rest of the way but Milwaukee wasn't able to get back into it. Christian Yelich stayed hot at the plate with two RBI singles in the game. He has been a constant in the Brewer lineup all season long. Lorenzo Cain also added two hits of his own on the night. The rest of the lineup was a combined 3-23 from the plate. The loss would push their record to 8-5. Milwaukee will have another tough series against the other LA team starting on Friday. The Dodgers will welcome the Brewers in for a rematch of the NLCS last season. Corbin Burnes will have his name called in the rotation for Milwaukee. He will square off against Julio Urias. First pitch will be thrown out at 9:10 from Dodger stadium. A Packerland Conference golf invitational in Green Bay scheduled for Thursday has been canceled. Gibraltar, Sevastopol, Southern Door, and Sturgeon Bay were supposed to meet their other conference rivals at The Woods Golf Course in Green Bay, but Mother Nature had a different opinion on whether or not the meet would take place. There are currently no plans of rescheduling. As of early Thursday morning, no other games in softball, baseball, or soccer had been postponed or canceled. Postponements and cancellation announcements are likely to come later today. Baseball: games begin at 5:00 p.m.
Soccer: games start at 4:30 p.m.
Not all high school students are athletes, but that doesn’t mean that they can’t be involved in athletics. The Athletic Training Aide (ATA) program at Sturgeon Bay High School allows students to be actively involved in athletics from a different angle. The ATA program started three years ago during the 2016-2017 school year. The program allows high school students to learn basic sports medicine skills and assist in after school coverage of the athletic training room as well as coverage of home sporting events with a certified athletic trainer. The program is designed as a Varsity lettering program. Students must complete at least 120 hours of after school and event coverage with a certified athletic trainer as well as complete assigned learning modules to qualify for the Varsity letter. Students are able to participate in the program year round or just during specific sporting seasons (Fall, Winter, or Spring) depending on their availability and participation in other extra-curricular activities. All students who participate in the ATA program are CPR/AED/First Aid certified and also learn a lot of practical sports medicine skills like how to handle emergencies when it comes to asthma, allergic reactions, splinting of fractures or dislocations, and taping of common sports injuries to name a few. During its first year, the program only had two students but has grown and currently has eight students who participate throughout the year. Most of the ATA students want to pursue some sort of degree in medicine in the future and see the program as a great opportunity to gain knowledge and experience. However, some students are just looking for a way to get involved with peers in high school and see the program as a fun way to be involved. 2018 Sevastopol graduate Max McHugh became the first ever collegiate freshman to earn NCAA All-American status from Door County. Competing in Austin, Texas, McHugh first swam the 100 breaststroke and swam a 50.30 in the qualifier. Then in the finals swam 50.52 and placed third in the nation in the 100 breaststroke. Then on the final day of the NCAA Championships Max was seeded eighth the 200 breaststroke and swam a time of 1:51.36 in prelims. Seeded third in the finals, McHugh swam a 1:49.41. His time was good enough for second place in the country. To be an All-American in NCAA swimming you must finish in the top eight at the NCAA Championships. So in the 2019 Championships, not only did Max McHugh become the first ever Door County graduate to become All-American as a freshman, he did it twice in the 100 and 200 breaststrokes. His time in the 100 breaststroke was the fourth fastest time in the event in United States history. In the 200 breaststroke, McHugh swam the sixth fastest time ever recorded in U.S. history. Next up for Max and his older brother Conner will be the Olympic Trials in the summer of 2020 with an eye on the 2020 Summer Games in Tokyo. The United States can only take two breaststorkers in each event. The Milwaukee Brewers lost 11-8 against the Los Angeles Angels. It was another episode of a slugfest as both teams put up runs easily. The Brewers rallied back from being six runs down at one point but eventually fell short. Freddy Peralta drew the start for Milwaukee. He was roughed up in the first inning. He would give up six earned runs in the bottom of the first. Seven total by the time he was taken out in the fourth. Yasmani Grandal had a monster night at the plate. He had two homers in the game to go along with three RBI and three runs. It was his first breakout game since being signed. That wouldn’t be enough as the Angels would rally late to put them away. The two teams will now run it back for the third and final matchup in the series. Brandon Woodruff will be taking the mound for Milwaukee. They have now dropped two in a row to start out the road trip. The Brewers will face Felix Pena for LA. First pitch will be thrown out at 9:07 from Angel Stadium of Anaheim. For both the girls and boys track and field teams for Sturgeon Bay and Southern Door, they finished first and second respectively in the Peshtigo Quadrangular on Tuesday. Peshtigo and Oconto also participated. Meanwhile, Luxemburg-Casco's boys and girls teams were in Clintonville picking up big points as well. For the girls in Peshtigo, the Clippers dominated the field picking up 156 points. The Eagles came in second with 56 points. It was a much closer finish in the boys events. 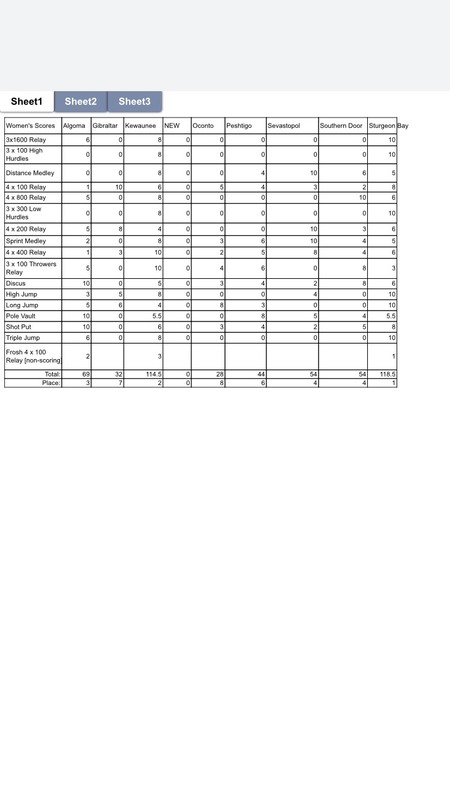 Sturgeon Bay led the way with 98 points. Southern Door picked up 85.5 which edged Peshtgo's 80 points for second place. Both of Luxemburg-Casco's track and field teams picked up victories in the Clintonville NEC Triangular. The boys got 86 points, while the girls won with 83. Two Kewaunee County baseball teams were in action on Tuesday. Algoma had one game while Luxemburg-Casco played a doubleheader. Algoma played in their second game of the season at Wausaukee. The Wolves came out with a 14-5 loss. Luxemburg-Casco won two games on Tuesday at home against Clintonville. Thursday's game was moved up to today in anticipation of bad weather. The Spartans won game one 6-0 and took game two in a more football-like score of 18-12. A couple of blowout wins headline the area's softball teams in Tuesday's games. Algoma had no issue with at Green Bay NEW Lutheran to pick up a conference win. The final score was 16-1. Luxemburg-Casco took their talents to Freedom and came out with a 12-2 win over the Irish in a North Eastern Conference battle. It was a rough Tuesday on the pitch for Door and Kewaunee County teams. There were three local teams in action on Thursday. Kewaunee played at Denmark in a non-conference matchup and lost 8-0. Sturgeon Bay's rough non-conference season continued with a 5-1 loss at Freedom. Luxemburg-Casco could not handle Ashwaubenon in a 4-0 loss on the road. The Green Bay Packers’ preseason schedule features an opener at Lambeau Field and all four games against AFC teams. The preliminary schedule was communicated by the National Football League on Tuesday. For the third consecutive season, the Packers are scheduled to open the preseason at home, hosting the Houston Texans. Leading into the game, the Packers will host the Texans for joint practices in Green Bay. Days and times will be announced at a later date. It is the first time the Packers will play against the Texans in the preseason. The Texans have played in Green Bay two times, with both meetings taking place in December (2008 and 2016). The Packers will go on the road for their second preseason game, traveling to Baltimore to play the Ravens. It marks only the second preseason meeting between the two teams. The only other preseason game between the two took place in Baltimore in 1996. The Packers’ third preseason game will be against the Oakland Raiders, with the location to be determined. It is the first of two preseason games (Kansas City) where Green Bay faces a team it also plays in the regular season. It will be the 11th time the Packers and Raiders have met in the preseason, including the fourth matchup in the past six years (2014, 2016 and 2018). Green Bay will close out the preseason against Kansas City at Lambeau Field. It is the second consecutive year the Packers play the Chiefs in the preseason finale and the eighth time since 2010. Spring is here, bringing with it warmer temperatures, green grass, and baseball season! Sturgeon Bay Boys Little League (formerly Sturgeon Bay Cal Ripken League) is a baseball league for boys ages 7-12, which teaches children the basics of the sport as well as sportsmanship. Not only do the boys get the chance to practice and learn the fundamentals of the sport, but they also get to play games among the other teams. And we, as parents and relatives, get the joy of watching our sons on the baseball fields staying active and having fun all at the same time. Registration is taking place RIGHT NOW! Forms are available by emailing sbboyslittleleague@gmail.com or by going online to our Facebook page “Sturgeon Bay Boys Little League” This is also a great resource to stay up to date with upcoming events such as tryouts, schedules, rain cancellations, as well as any other important information for the league. Sturgeon Bay Boys Little League 232 S 12th Avenue, Sturgeon Bay, WI 54235. All Games are played at the three fields by Sunset Park. There are three divisions for children: Rookies, Minors and Majors based off of their date of births. Majors games are played on Monday and Wednesday nights while Minors/Rookies play on Tuesday and Thursday nights. Each child receives a team T-shirts and a baseball cap for the season. Players are responsible for supplying their own baseball glove and gray pants. Other equipment is provided unless a child wants to bring their own batting helmet or bat. The Sturgeon Bay Boys Little League is looking forward to a great season with our Door County Youth! See you on the fields! Be sure to mail in OR drop off your registration forms/fee TODAY!! The Milwaukee Brewers lost 5-2 against the Los Angeles Angels. It was the opening game of a week full of matchups against the LA teams. Jhoulys Chacin started on the bump for Milwaukee and faced off against Trevor Cahill of the Angels. Chacin hummed in this start. He went a little over six innings only giving up three earned runs. It was a quality start produced by the Milwaukee hurler, but he would still wind up with a loss. Run support was hard for him to find in this one. Orlando Arcia got things going in the second with an RBI single to give the Brewers a lead early on. Mike Moustakas would go deep to center field in the fourth inning to account for the other run. Mike Trout robbed Christian Yelich of a homer in the game. One MVP robbing another MVP. The Brewers just had a tough time getting enough runs across and eventually fell in LA. They will now run it back for another game on Tuesday. Freddy Peralta will be taking the mound for Milwaukee. He will face Matt Harvey for LA. First pitch will be thrown out at 9:07 from Angel Stadium of Anaheim. Tuesday is proving to be an important day on the calendar for local schools. This afternoon marks the final day of competition before a snow storm is expected to hit the area on Thursday, dumping several inches in the process. You can find more information about some of the upcoming events at DoorKewauneeHighSchoolSports.com. Luxemburg-Casco vs. Clintonville, Wrightstown @ Clintonville 4 p.m.
Southern Door, Sturgeon Bay, Peshtigo and Oconto @ Peshtigo 4 p.m.
Gibraltar, Sevastopol, Kewaunee, Algoma, and NEW Lutheran @ Sevastopol 4 p.m.
Algoma vs. Wausaukee 5 p.m.
Luxemburg-Casco @ Freedom 4:30 p.m.
Algoma @ NEW Lutheran 5:00 p.m.
Luxemburg-Casco @ Ashwaubenon 6:30 p.m.
Sturgeon Bay @ Freedom 4:30 p.m.
Gibraltar/Sevastopol vs. Marinette @ Baileys Harbor Town Park 4:30 p.m.
Kewaunee @ Denmark 4:30 p.m. The wrong kind of storm won games throughout northeast Wisconsin Monday as Sturgeon Bay saw their game called after three innings. The Clippers saw a 2-0 lead vanish thanks to a string of singles in the third inning by NEW Lutheran. The Blazers eventually took a 3-2 lead before the game was suspended due to lightning in the area. The Kewaunee Storm did not fare much better, losing to Oconto 7-3 despite two hits from Daniel Stangel. You can find more coverage at DoorKewauneeHighSchoolSports.com. Luxemburg-Casco remains unbeaten on the young season for the area's lone softball win Monday. In Waupaca, McKenzie Hanson, Ally Dart, Jenna Jorgensen, and Ali Routhieaux all collected two hits in a 9-0 Spartans win over the host Comets. The afternoon set was short a game and an inning thanks to lightning. Tehya Bertrand clubbed a three-run homer, but the Southern Door Eagles could not survive a 12-hit barrage by Seymour in an 8-4 loss in Brussels. Jessica Jacobson, Jackie Atkins and Bertrand all had two hits to lead the Eagles. Kewaunee received RBI hits from Mykenzi Uhlers, Alaina Ledvina and Taylor Schlies, but it was not nearly enough in a 13-3 loss to Oconto. The Milwaukee Bucks last 60-win season came in 1981. The 2018-19 Bucks could hit 61-wins if they can finish out the season Wednesday night with a victory against the Oklahoma City Thunder. On Sunday, Milwaukee took care of business against the Atlanta Hawks 115-107. Giannis Antetokounmpo led the way with 30 points and nine rebounds while getting more rest than usual. Khris Middleton added 21 points, Sterling Brown scored ten as did D.J. Wilson in the Bucks victory. The Milwaukee Brewers squared off and beat the Chicago Cubs 4-2 on Sunday afternoon. Zach Davies started on the bump for Milwaukee and faced off against Kyle Hendricks of the Cubs. Miller Park was packed once again for this I-94 rivalry. The Brewers wasted no time getting runs on the board in the bottom of the first inning. Lorenzo Cain started it off with a single to leadoff the inning. Then, Christian Yelich came up to the plate and launched a two-run bomb to right field. It was his 100th of his career and his fifth on the early season. That would put Milwaukee up 2-0 early on in the game. The Brewers added to that lead with an RBI single from Travis Shaw in the bottom of the third inning. Christian Yelich would drive in a run as well with a sac fly right after. That would put Milwaukee comfortably ahead with a 4-0 lead heading into the top of the fifth inning. Zach Davies was in control on the mound all day against the Cubs lineup. He went nearly six innings strong only giving up two unearned runs on his start. He would hand the ball over to the bullpen with a 4-2 lead. From there, Alex Claudio came in and got an out in the seventh before getting into trouble. Josh Hader was summoned from the bullpen early to come on and clean up a one-out mess. He would get a pop out and a strikeout to bail the Brewers out. He continued on to close out the eighth and ninth innings to secure the win for Milwaukee. He picked up his fifth save of the season in dominant fashion. Milwaukee will now get on a plane and travel to Los Angeles to start a series on Monday against the Angels. Jhoulys Chacin will take the mound for the Brewers as he will square off against Trevor Cahill. "The Crew" will look to carry their momentum into this next week where they will be squaring off against both LA teams on the road. The weekend was short for several area baseball teams as they hit the diamond Monday for a number of games. In Packerland Conference action, Sturgeon Bay hits the road to face Green Bay NEW Lutheran, Sevastopol hosts Peshtigo, Gibraltar travels to Algoma, and Kewaunee plays at Oconto. All games begin at 5 p.m.
Area softball teams will start off the week with a number of games on Monday afternoon. In Northeastern Conference play, Luxemburg-Casco will play a doubleheader at Waupaca beginning at 4 p.m.
Packerland Conference action this afternoon includes Kewaunee traveling to Oconto, Sturgeon Bay heading south to play Green Bay NEW Lutheran, Southern Door staying at home to play Seymour, Algoma playing at home against Gibraltar, and Sevastopol hosting Peshtigo. 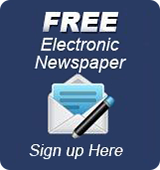 You can get more coverage online at DoorKewauneeHighSchoolSports.com. Game 1 on Saturday saw Sturgeon Bay shut out Rio 14-0 in 5 innings behind the 2-hit pitching of freshman Chris Lodl. His performance included 6 strikeouts and 2 walks. Hitting leaders with 2 hits each were Ryan Jacobson, Mitchell Jackson, and Trent Ehlers, with Ehlers producing 4 RBI with a double and a triple. of Wild Rose in game 2. Jake Schneider had a monster day at the plate, going 4-4 with 7 RBI. Ryan Jacobson and Reece Nellis had 2 hits each, and Max Bordeau put Wild Rose out of their misery with a 3-run HR in the final inning of the 5-inning game. Sturgeon Bay now travels to NEW Lutheran on Monday for a Packerland Conference battle. A day after both schools lost in the opening game of the Notre Dame Quad, Luxemburg-Casco and Sturgeon Bay tied each other at two on Saturday. Starr and Fischer Beckham scored the two goals for the Clippers. On Friday, Sturgeon Bay lost to the host school 7-1, while L-C lost a tough hard-fought game to Lakeland 1-0. The Spartans next match will be on Tuesday at Ashwaubenon at 6:30 PM. Sturgeon Bay will play at Freedom on Tuesday at 4:30 PM. The Brewers six-game winning streak and the Cubs six-game losing streak both ended on Friday night at Miller Park. A night after 23 total runs were scored in a Brewers win, there were 22 combined runs in a Cubs victory. The final score was 14-8. Lorenzo Cain led off the game in the bottom of the first with a home run. He would later double in a run as well. However, the major star of the night was the Cubs Jason Heyward who went 3-3 with two homers, two walks and two stolen bases. Ryan Braun did his best to keep the Brewers in the game with a three-run shot in the seventh to cut the Cubs lead to 7-5. The Cubs then put the game away in the very next half-inning by putting up seven on the board. Eric Thames would add a three-run home run in the bottom of the eighth to cap the scoring. Brewers starting pitcher Corbin Burnes struggled in five innings of work allowing seven runs. He was the losing pitcher. Alex Wilson came in the game in the 8th and only recorded one out and allowed six earned runs. Cole Hamels started for the Cubs and was the winning pitcher going six innings and allowing only two runs. The two division rivals will play the rubber match of the series on Sunday afternoon at 1:10. The Milwaukee Bucks lost to the Brooklyn Nets 133-128 Saturday night. They were without Giannis Antetokounmpo who was sidelined with a left calf injury. Fiserv Forum was packed and the game definitely had a playoff feeling to it. 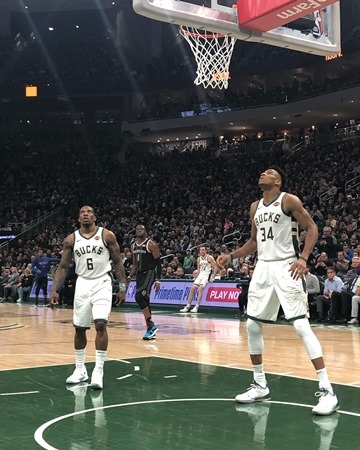 Eric Bledsoe and Khris Middleton shouldered most of the weight with Giannis being out. Eric Bledsoe went for a career-high 33 points to go along with 11 assists. Middleton chipped in 24 points of his own. D’angelo Russell scored 25 points and dished out 10 assists to lead the way for the Nets. The Bucks pulled together a fourth quarter comeback to put them up a point inside the final two minutes. Missed free throws by Milwaukee eventually cost them down the stretch and allowed Brooklyn to escape with the win. The team will rest up before playing another game at Fiserv Forum Sunday. They will welcome in the Atlanta Hawks. The Bucks are still searching for their 60th win on the season with two games to go. Tip-off will be at 6:00. Gibraltar participated in the Neenah Boys Indoor Invite on Friday and picked up 28.5 team points. Victor Jauregui, Leif Olson and Evan Henry were some of the standouts for the Vikings. Visit the Gibraltar page at DoorKewauneeHighSchoolSports.com for a full recap of the action. It was a busy night on the diamond for Door and Kewaunee County high schools. Those teams went 4-1 on the day. Gibraltar defeated Loyal in a tournament in Mauston by a final score of 5-4. Southern Door's freshman pitcher Charlie Neinas pitched a no-hitter against Algoma, leading the Eagles to a 1-0 victory. Sturgeon Bay had no problem with Oconto winning 10-0 in five innings. Luxemburg-Casco won a conference home game against Marinette 7-3. Go to DoorKewauneeHighSchoolSports.com for the latest recaps. It seemed defense and pitching were not required in Milwaukee Friday night as the Brewers defeated the Cubs 13-10. Ryan Braun, Eric Thames, Hernan Perez, Yasmani Grandal and Orlando Arcia all hit home runs for the Brewers. Chase Anderson came out of relief to pick up the win. Milwaukee has now won six games in a row and is 7-1 on the season. They'll take on the Cubs again on Saturday night at Miller Park, first pitch at 6:10. Tryouts for the Major Leagues will be held from 5:00-6:30 on April 23 at Sunset Park (weather permitting). One change this year is that all 11 and 12 year-olds will be playing in the Majors. Therefore, any players in that age group who have not played in the Majors must try out. Coaches will use their notes from tryouts to create teams as fairly as possible. 10 year-olds who would like to try out can do so. There is no guarantee they will be drafted into the Majors, but they are welcome to try. The Milwaukee Bucks beat the Philadelphia 76ers 128-122 Thursday night. Giannis Antetokounmpo led the way with a monster night. He had 45 points to go along with 13 rebounds. It was another vintage MVP performance this season. Eric Bledsoe got ejected from the game right away after Joel Embiid threw a ball at him and he retaliated. He rifled the ball back at him and got thrown out of the game early on. That would provide a spark for the Bucks all night in a heated matchup. Milwaukee would hold on and close out the fourth quarter to clinch home-court advantage throughout the playoffs. They are now one win away from hitting 60 wins on the season. All led behind the best player in the league, Giannis. The Bucks will now have a day off before they go for their 60th win against the Brooklyn Nets on Saturday. Tip-off will be at 4:00. 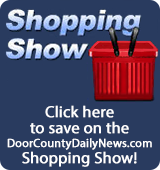 Door County Daily News will be down for the coverage. The Kewaunee boys track team came out the big winners Thursday on a day the Storm and the Gibraltar Vikings' girls team saw action. The Storm scored 159.5 points in the eight-team invitational in Denmark. Max Hanrahan (800m), Nick Baumgartner (300m hurdles and pole vault), the 4 x 400 relay, Tanor Bortolini (shot put), and Elliot Van Goethem (Discus) all captured titles. The girls' team took 5th in the meet, led by top four finishes by Sara Dax (shot and discus), 4 x 800 relay, Elizabeth Lamach (1600m and 3200 m run), and Ashlyn Pribek ( 400m and 800m run). The Vikings' girls found themselves still inside at a meet held in Neenah. In the team's fifth place finish that featured mostly Division 1 squads, Abbi Sitte (55m dash, high jump, and long jump) and the 4x160 relay team collected top 3 finishes. On Friday, the Gibraltar boys get their chance to shine in Neenah beginning at 4:15 p.m. You can find full results for Thursday's meet online at DoorKewauneeHighSchoolSports.com. It was a nailbiter in Fish Creek and a blowout in Peshtigo as Gibraltar and Kewaunee both picked up early season victories Thursday. Two big rallies in the second and sixth innings along with a strong pitching performance by Daniel Stangel gave the Storm the 11-1 victory over the Bulldogs. A two-hit, two RBI day for Spencer Krause was the difference in the Vikings' 7-6 win over the visiting Pioneers. You can find more details about these games at DoorKewauneeHighSchoolSports.com. Baseball action for Friday includes Sturgeon Bay hosting Oconto and Southern Door playing at home against Algoma. The Luxemburg-Casco Spartans and Southern Door Eagles softball teams had impressive performance during their shutout wins Thursday. Sevastopol knocked off their conference rival Gibraltar. A five-spot in the fifth inning was all pitcher Aly Dart needed as the Spartans rolled to a 5-0 victory over Marinette. For the second time this week, Southern Door did not need to play a full seven innings to win, shutting out Algoma 12-0 in just five frames. Sevastopol recovered from their blowout opening day loss to slip by Gibraltar 7-6. Karley Schram led the Pioneers going 2-3 including a three-run homer. Softball games slated for Friday include Kewaunee hosting Two Rivers and Sturgeon Bay battling at home against Oconto. A 26-8 run by the host Marshall Thundering Herd ended the season for the Green Bay Phoenix Thursday night with a 90-70 defeat in the CollegeInsider.com Tournament championship game. Sandy Cohen, JayQuan McCloud, and Shanquan Hemphill led the Phoenix in scoring with all three registering double figures in points. The Phoenix actually held a double-digit lead for large portions of the first half before entering halftime with just a 42-40. The Thundering Herd put the clamps down on the Phoenix in the second half, allowing them to only shoot 27 percent from the field and kept their visitors scoreless for the final five minutes. The Phoenix finished the season 21-17 while breaking several program records along the way. Six of the seven Door and Kewaunee County high schools are participating in at least one sporting event on Thursday. Kewaunee has four events on Thursday while Gibraltar has three. Both Kewaunee's girls and boys track and field teams will travel to Denmark High School for the Denmark Cold Vike Invite. The Gibraltar girls track and field team will head to Neenah High School for the Neenah Girls Indoor Invite. Sevastopol goes up to Gibraltar and Kewaunee will play at Peshtigo. Kewaunee will play at Chilton. Sevastopol will also play at Gibraltar in Softball as well. Algoma and Southern Door meet in a conference matchup. While Luxemburg-Casco will host Marinette. The Storm girls soccer team will play at Green Bay West. The Milwaukee Brewers beat the Cincinnati Reds 1-0 Wednesday afternoon. Manny Pina provided all of the run support needed in this one with an RBI single in the second. It was a low scoring affair in the final game of the series. Freddy Peralta was dominant on the mound for Milwaukee. He went a career-high eight innings of shutout baseball while striking out 11 in the contest. He would pick up his first win of the season. With Josh Hader not available for the game after pitching the previous two, Alex Wilson came in to close the ninth. Couple threats in the inning, but he would come out with a save. After sweeping the Reds, “the crew” is now 6-1 on the season. Sturgeon Bay varsity girls soccer lost 3-1 to Sheboygan Lutheran on Tuesday. Madison Starr scored in the fourth minute to give the Clippers the lead. Sheboygan Lutheran scored twice to take a 2-1 advantage into half time. Sturgeon Bay was unable to score in the second half and Sheboygan put the game away with a third goal in the 70th minute. In goal for the Clippers, McKenna Gibson had seven saves in the loss. Baseball and softball seasons are in full swing in Door and Kewaunee County. Six of the seven schools in those counties were in action on Tuesday. Gibraltar split at Green Bay NEW Lutheran with the softball team victorious 25-3 and the baseball team losing 12-7. Sturgeon Bay played at Kewaunee and those teams split their matchups as well. Sturgeon Bay baseball won 17-0 in six innings. Kewaunee softball knocked off the Clippers 14-4. Southern Door baseball won in dramatic fashion over Sevastopol. Derik LeCaptain hit a walk-off single to give Southern Door a 7-6 victory. The Eagles softball took care of the Pioneers 15-0. Luxemburg-Casco earned a split on their home fields. Spartan baseball fell to Marinette 7-1. The softball shutout Valders 4-0. Luxemburg-Casco picked up their first win of the season while Sturgeon Bay lost their opener. The Spartans' home opener went very well for them as they knocked off Green Bay NEW Lutheran 3-0. Heather Iverson, Brynn Holzwarth and Allison Prevost all scored goals. Natalie Haen picked up her second shutout this season. L-C will play at Lakeland on Friday at 6:30 PM. Sturgeon Bay opened their season at Sheboygan Lutheran and lost 3-1. Mad Starr scored the lone goal for the Clippers. Sturgeon Bay will play at Notre Dame on Friday at 4:30 PM. Orlando Arcia's first hit of the season couldn't have come at a better time for the Brewers. With the game tied at one in the sixth, Arcia hit a three-run home run off Reds reliever Michael Lorenzen. Milwaukee would be able to hold on to the lead and win by a final score of 4-3. Arcia came into that at-bat in the sixth at 0-14 on the season. Jhoulys Chacin got the start on the mound for the Brewers and picked up the victory pitching 5 2/3 innings allowing 2 runs. Josh Hader picked up his league-leading fourth save. Zach Duke got the loss in relief for the Reds. The Brewers have now won four games in a row. They will finish up their three-game set in Cincinnati in a Wednesday matinee with the first pitch coming at 11:35 AM. The Milwaukee Brewers beat the Cincinnati Reds 4-3 Tuesday night. Jhoulys Chacin started on the bump for Milwaukee only giving up two earned runs in a little over five innings. He would earn the win with that effort. The Brewers would get on the board first with a Jesus Aguilar RBI single in the top of the third. Orlando Arcia provided all the pop in this game. He hit a three-run bomb in the top of the sixth inning to put Milwaukee up 4-1. It was his first hit of the season. The Reds would plate two runs before the ninth inning to summon Josh Hader on to close it out. He would strike out two and pick up his fourth save in six games. The Brewers move to 5-1 early on in the season. The two teams will now run it back for game three of the series tomorrow. Milwaukee will trot out Freddy Peralta to try and help the team complete the sweep. First pitch will be thrown out at 11:35 from the Great American Ball Park. Sandy Cohen III's late-game heroics now has UW-Green Bay on the verge of a postseason championship. The Phoenix defeated Texas Southern 87-86 in overtime on Tuesday night in the semifinals of the CollegeInsiders.com Tournament. Texas Southern took the lead on a putback layup by Jeremy Combs with eight seconds left. UW-Green Bay called a timeout and called a play for Cohen who came down the floor to hit a foul line jumper with 1.5 seconds left. Texas Southern's heave did not hit the rim. The game was tied at 76 going to overtime after the Tigers finished regulation on a 6-0 run. Cohen tied with Texas Southern's Tyrik Armstrong for a game-high 23 points. The Phoenix will travel to Marshall on Thursday in the championship game of the CIT, tip-off at 6 PM. The Milwaukee Brewers beat the Cincinnati Reds 4-3 Monday night at the Great American Ball Park. Zach Davies drew his turn in the rotation as he faced off against Tanner Roark for the Reds. It was a cold matchup that winded up keeping a lot of balls from going out. The Brewers got right after it in the first inning when Jesus Aguilar drove in two runs on a double to open up the scoring. Mike Moustakas would continue his hot start to the season by adding an RBI double as well. Milwaukee would push their lead out to 3-0 early on after the first inning. Zach Davies had an efficient day on the mound against the Reds. He went five innings strong only allowing two runs to come across in the fifth. Cincinnati plated another run in the seventh off of Alex Claudio to knot the game up 3-3. It was late-game excitement again for Milwaukee in this one. In the top of the ninth with two outs, Christian Yelich ripped a double to left field. Ryan Braun stepped in next and ripped a double down the left field line to score Yelich and give the Brewers the lead. Josh Hader would trot in to close out the bottom of the ninth and earn his third save of the season. The two teams will now run it back tomorrow for the second game of the series. Jhoulys Chacin will take the bump to face off against Anthony DeSclafani of the Reds. First pitch will be thrown out at 5:40 from the Great American Ball Park. Milwaukee is now 4-1 early on in the season. The Milwaukee Bucks blew past the Brooklyn Nets 131-121 in their matchup Monday night. Giannis Antetokounmpo scored 28 points and secured 11 rebounds for the Bucks in his return to the lineup after being injured. Eric Bledsoe chipped in 29 points of his own as he really set the tone in the first half. Reserve guard George Hill came off the bench and provided a spark for the team as he scored 22 points in the contest. The Nets cut the lead down to four halfway through the fourth before the Bucks went on a 7-0 run to help eventually close out the game. Milwaukee will now have a couple of days of rest before they travel to Philadelphia for their matchup with the 76ers Thursday night. The Bucks are now closing in on the best overall record in the NBA and home-court advantage throughout the playoffs. For the first time this season, area track athletes will get to feel the elements while competing as Southern Door hosts the first outdoor meet of the year. Algoma, Southern Door, Sevastopol, Kewaunee, and Sturgeon Bay are all slated to be at the meet, which begins at 4 p.m. with the field events. The Storm is also scheduled to have some athletes competing about an hour away in De Pere. There they will face Freedom, Lena, and West De Pere with field events kicking things off at 4 p.m.
Three area teams will be in action Tuesday afternoon as the girls' soccer season begins to pick up steam. All three games have Packerland Conference ties as Luxemburg-Casco travels to Green Bay to face NEW Lutheran, Kewaunee hosts Elkhart Lake-Glenbeulah, and Sturgeon Bay plays on the road at Sheboygan Lutheran. Slowly but surely, area baseball diamonds are getting their first game action of the year. Luxemburg-Casco will hope to follow Sturgeon Bay's lead from yesterday's 16-9 win when they face Marinette this afternoon at 4:30. The two teams have decided to only play a single game, scratching the previously scheduled doubleheader. The Clippers hope to make it two in a row when they head down to Kewaunee for a 5 p.m. tilt. Also playing at 5 p.m. is Gibraltar playing NEW Lutheran and Southern Door hosting Sevastopol in a game originally slated to be played in Institute. Playing opposite their baseball counterparts, Gibraltar plays at NEW Lutheran, Southern Door hosts Sevastopol, and Sturgeon Bay travels to Kewaunee. All games begin at 5 p.m.
Luxemburg-Casco will stay at home to play Valders at 4:30 p.m.
singles, 2 RBI), Jake Schneider 3-5 (2 singles and a double, 4 RBI), Trent Ehlers 3-5 (2 doubles and a single, 4 RBI), Max Bordeau 2-4 (single and double, 2 RBI), Abram Abeyta 2-4 (both singles, 1 RBI). The pitching duties were shared by Max Bordeau, Anthony Jennerjohn and Chris Lodl, all making their first varsity pitching appearance. Packerland Conference game of the season. Sturgeon Bay High School Varsity Softball will host their first home game of the season Friday night. Here is a look at the Clippers home game schedule for the season. All games will start at 5:00 PM. Sturgeon Bay summer baseball is back! Formerly known as Cal Ripken, the now Sturgeon Bay Boys Little League® Baseball program has joined forces with the Sturgeon Bay Girls Little League® Softball program. The softball program has graciously allowed the baseball program to join their website and online registration at https://www.sturgeonbaylittleleague.org/ . The previous Cal Ripken board members have been helping to ease the transition to the new league. There will be few, if any, noticeable changes for the players who formerly participated in Cal Ripken. Sturgeon Bay Boys Little League® Baseball is open to ages 7-8 (Rookies), 9-10 (Minors), and 11-12 (Majors). Bats, helmets, catcher's gear, and team jerseys will be provided. All players need their own glove and grey pants. Plastic/rubber cleats are recommended, particularly for players in the Minors and Majors. All games are played on weekday evenings at the Sturgeon Bay Sunset Park baseball fields. Registration is now open and the deadline is April 15th! Families with girls in the softball program will use the same account to register their boys for baseball. New families will create an account, which can be used every year. When you register your child, make sure to choose the Boys Little League® option and the correct Age Group. You will receive a verification email from the Sturgeon Bay Girls Little League® – Don’t worry, this is the correct registration. There will be 2 forms (medical release, and concussion agreement) that need to be filled out and emailed to the Boys Little League® email address: sbboyslittleleague@gmail.com before they will be allowed to participate. Sturgeon Bay Baseball is scheduled to get underway with a home game this week. Here is a look at the schedule for home game dates for the Clippers Baseball program with their start times all at 5:00 PM. (Some baseball games might start at 4:30). Tuesday's home JV1 baseball game against Marinette has been canceled. It reads like an April Fool's joke, but the Sturgeon Bay Clippers do in fact have a baseball game Monday morning in Green Bay. The Clippers and the Marinette Marines will sail down to Green Bay NEW Lutheran for a 10 a.m. tilt. NEW Lutheran may have one of the drier fields in the area after the Southern Door Eagles saw their baseball and softball games moved to the home of the Blazers instead of being hosted in Brussels. Both teams will have quick turnarounds as the Marines are scheduled to host Luxemburg-Casco and Clippers head to Kewaunee for Tuesday afternoon games. The Milwaukee Brewers beat the St. Louis Cardinals 5-4 in walk-off fashion Sunday afternoon. Corbin Burnes drew his turn in the rotation as he faced off against Michael Wacha for the Cardinals. The roof was closed again and the fans were cozy inside for this matchup. Christian Yelich continued his insanely hot start to the season with another bomb to right field in the first inning. He is the sixth player in MLB history to hit a homer in each of the teams first four games. That would give Milwaukee a 1-0 lead after the first inning. Corbin Burnes came out of the gate humming. Through his first three innings, Burnes struck out nine Cardinal batters. Pretty impressive for his first MLB start. Some minor hiccups came in the fourth and fifth inning when he allowed a two-run bomb to Paul DeJong. Then back to back solo shots from Matt Carpenter and Paul Goldschmidt would put the Cardinals up 4-1. The Brewers started to rally back in the seventh inning though. Ryan Braun singled in a run to start off the comeback. Travis Shaw would follow that up with an RBI single of his own to get the score to 4-3. The dramatics came in the ninth when Christian Yelich hit a walk-off double to left center that scored Lorenzo Cain and Ben Gamel. Yelich is doing all-time great things at the plate so far this year. It was a fitting way to end an exciting opening series that the Brewers took three out of four games. Milwaukee will now travel to Cincinnati to begin a series with the Reds Monday. Zach Davies will be next up in the rotation for the Brewers. He will be going against Anthony DeSclafani for Cincinnati. First pitch will be thrown out at 5:40 from the Great American Ball Park.